(TibetanReview.net, Jul25, 2018) – Following days of raucous rallies in which shops were vandalized and shop owners forced to pay donations or otherwise subjected to threats in the name of opposing government welfare and other facilities for Tibetan refugees carried out by a group called Students’ United Movement of All Arunachal (SUMAA), the District Magistrate of West Kemang in India’s Arunachal Pradesh state has issued a prohibitory order on Jul 23, banning all gatherings of more than four persons. The ordered, issued under Section 144 of India’s Criminal Procedure Code, extends to and around all market areas, refugee settlements and government establishments in the entire district. All wine shops of Bomdila, Tenga and Rupa markets have been ordered to remain closed. The order also bans carrying of lethal weapons and requires police posts to register all vehicles entering the district. 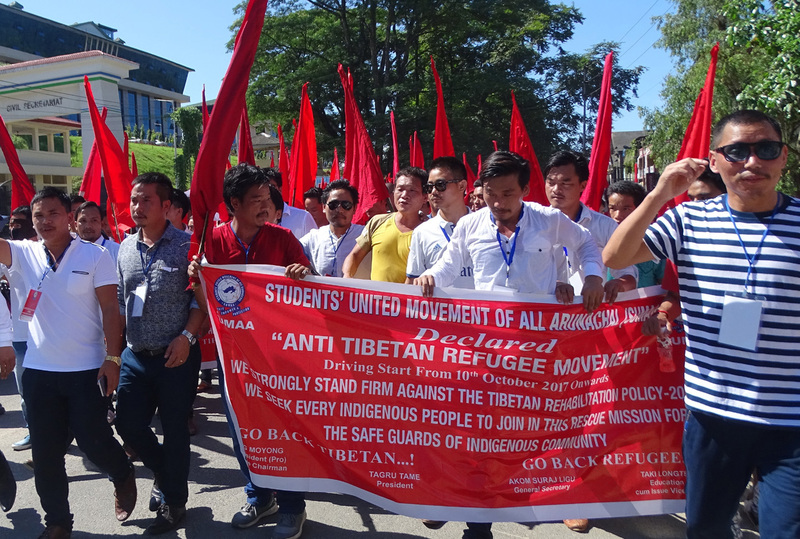 The apparently not-so-representative student body called SUMAA which virulently campaigns to confine Tibetans living in the state to refugee camps without any sort of welfare entitlement or means of livelihood, has been facing backlash from the mainstream communities. During its rallies, SUMAA had illegally sought to check the residential certificates and trading licenses of shops and building owners in the district. The report also said there were cases of forcible collection of donations, intimidations, and victimizations of residents. Video clips show SUMAA members vandalising apparently Tibetan shops and tearing down their signboards, while police looked on without taking any action, reported Tibetsun.com Jul 21. The legislators and all the CBOs who took part in the meeting had called for zero tolerance towards any such activities, and urged the local people to stand united. They have also appealed to the people to come out of the fear psychosis and extend every possible help to the district administration and the police to curb such menace in future. Also, reported nenow.in Jul 22, a mass rally called by the CBOs of all the six indigenous tribes of the district, All West Kameng Students’ Union, Community Based Students’ Organizations and Bomdila Town Committee was also held in protest against the highhandedness of SUMAA on the issues they had raised. The participants were reported to have called on the local administration to take strict action against any violation of law and order in the district. It said Bomdila MLA Japu Deru had, few days back, called on the people to stand united and stand tall against any perpetrators bent on disturbing the peace and tranquility of the area. He has said no one had the right to take the law into one’s own hand. Tibetsun.com said a former abbot of the famed Tawang Monastery, a local Monpa tribal, had also urged SUMAA to stop the protests and called on the people to come together to plan for legal action against the group in case it refuses to heed the call. SUMAA has been demanding the cancellation of the Scheduled Tribe (ST) certificates allegedly issued illegally to Tibetan refugees, surrender of trading licenses obtained by Tibetan refugees, a written undertaking from the Central Tibetan Administration that Tibetans won’t claim Indian citizenship, and deportation of Tibetans to the demarcated camps allotted to them from the places where they were presently operating businesses in other parts of the state such as the capital Itanagar. SUMAA has said it suspected 15 of the 123 Tibetan refugees settled in West Kameng district of possessing both ST (Scheduled Tribe) and refugee status documents. But so far, it has been able to name only one person to be “proven” guilty of it and even that remains to be determined by the lawful authorities. SUMAA has announced that it will launch a third phase of its thoroughly ill-informed anti-Tibetan campaign, whose success will only tarnish the state’s reputation while not yielding any tangible benefit to its residents, on Jul 25.